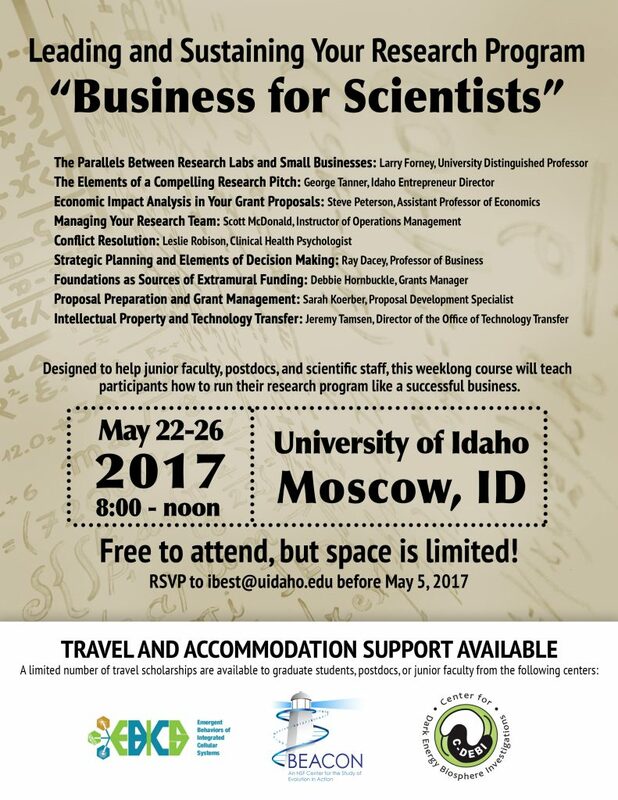 With supplemental funding from NSF, BEACON is co-sponsoring a week-long “Business for Scientists” course offered at the University of Idaho, May 22-26. This course is designed to help junior faculty, postdocs, and scientific staff run their research program like a successful business (see the flyer for additional details). The course is free to attend, and there is travel and accommodation support available from BEACON. You must RSVP by emailing ibest@nulluidaho.edu by May 5. If you would like to apply for BEACON travel funds to this course, please contact Danielle Whittaker. This entry was posted in Education, Member Announcements. Bookmark the permalink.